Are your kids kicking up a stink when you ask them to help out around the house? Are you struggling to find age appropriate chores for your family to help with? Are you sick of looking at your older kids untidy room? Do you wish you had a system that actually worked? Well look no further than our amazing free printable kids chore charts for kids of all ages and abilities! From a very young age, kids love to help out, I’m going to show you how to tap into their eagerness to learn and get your toddlers, tweens and teens to be self-reliant. I’ll give you strategies to help you create your own kid’s chore charts. I’ve created these beautiful age-appropriate responsibility charts, for kids of all ages, and they’re waiting for you to download for free from our amazing printable resources library! From toddlers to teenagers, it can be a struggle for parents to get their kids to help out. I’m going to give you some strategies to get your kids to create great habits one simple step at a time. The benefits of using printable kids chore charts. The main reason we use a chore chart in our house is as a motivational tool, my kids love to tick jobs off on their kid’s chore list after they’ve compleated them. I use it as a responsibility chart to help them understand the jobs that need to be done every morning and every evening before they watch television or have screen time. Using printable kids chore charts helps stop any arguments and helps establish a routine. Now the kids have gone back to school there is no better time to start to use my free printable kids chore charts to help get homework, spellings, reading and showers done in the evenings. I’ve given you a customisable kids chore chart so you can fill in your own age-appropriate chores or create your add your own weekly chore. I bought a cheap laminator and get my kids to tick when their jobs are done. 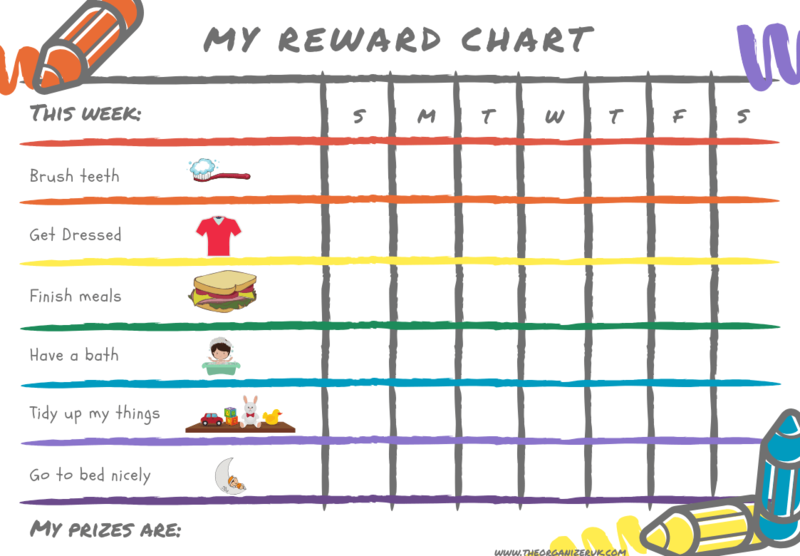 Just click on the button to download your free printable kid’s chore charts. We are not trying to get our kids to do hundreds of jobs around the house and we are not trying to offload our responsibilities onto our kids. We are striving to create one great habit at a time to enable our kids to learn the skills they need to carry them through life. Giving kids chores enables the whole house to work as a team. Allows them to see how the household runs. Lets them see how much work is involved in getting chores done. Gets children learning by measuring, weighing and reading quantities. We are not suggesting that your children should be doing the work of an adult in the house, but simple kids chores which they already enjoy gives them a sense of value within the family. How to create an age-appropriate kids chore chart. You know the struggle if you’ve ever asked a kid to do something, they drag their knuckles and grunt some response, while eye rolling all at the same time. My daughter will do any chore for you if she thinks there’s something at the end of it for her. My son will help out if it is his idea, however, if you ask him to do anything for you then he’s not so keen! He will, also, however, sell his soul for a sticker! You know your child better than anyone, think about the jobs that they continually ask to do with you and jot them down, you’ll need this later when it’s time to create your children’s chore chart. If your kids can use a remote control, iPad, or games console without any problem at all, then they should have no trouble working the washing machine! Toddler chore chart printable with pictures. Toddlers should be given simple age-appropriate tasks as soon as they can make a mess! For instance, little tiny kids love dropping things in boxes and tubs so putting stuff away is all part of the fun for them. Dusting especially with a feather duster! Teach your toddler one skill from the list above and keep repeating this task every day. I’ve created a fabulous toddler chore chart, which your toddler will love! Give your toddler a sticker each time they achieve this daily skill then reward them at the end of the week with something they love to do, like a visit to the park. Once this skill has become a habit for your toddler, you can then teach them another choice from the list and replace it on the chart. Do not swamp your little one with more than one task; you’re trying to create good habits, not a list of jobs for your toddler. At this stage, there should only be one job on the chart for them to master. Kids in primary school still have the eagerness to learn new skills and the eagerness to please, so it’s still a great time to teach new skills to support their learning at school. Being able to look after and feed a pet is also a great way to teach your kids responsibility and to introduce the concept that there are other priorities in the house to tend to. It’s super important for you to sit down with your child and teach them how to compleat the job correctly and where they will find all the equipment to use, and how to tidy everything away afterwards. It is vital that they know how to do a job from start to finish. Kids pretend play cleaning set. At this age, children’s skill sets are increasing, and they can have a little bit more responsibility for themselves such as getting swimming kits ready, preparing packed lunches and making lunches on the weekends. Children of this age still have a keenness to learn new skills and enjoy helping out, so it is reasonably straightforward to teach them some new skills. Although their skill set is increasing even further, it can be an age where kids like to complain about chores and doing jobs. It’s important at this stage to remember to try to adapt your child’s chore chart with jobs they love doing, remember that you’re still trying to create good habits, not offload your work! Taking wheelie bins out and bringing them back in. Age 11 plus chore chart jobs. We are at the critical age where it’s almost impossible to try to get your kids to do anything unless you’ve already developed ingrained habits from a young age as described in the paragraphs above. Try to remember your teenager is going through a lot of physical changes, has a tremendous amount of pressure at school, may be struggling to find their feet within friendship groups and many other substantial emotional issues which can see them retreat into themselves quite a lot. It is important not to force the issue but to encourage teamwork for teenagers. If you’ve got a teenager who likes to be alone, they may enjoy the solitude of taking the dog out for a walk each morning. They may fancy helping you to cook the dinner. This isn’t a time to ramp up the number of jobs on your teenager’s chore chart, but to instead simplify it only to include jobs they enjoy. How to teach your kids to do chores. Talk your kids through one chore from the list, carefully and patiently show them how to do the task together, you’ll find your kids enjoy spending one on one time with you, particularly if you chat while you are doing the chore. Kids love learning new stuff. Give your kids a one job at a time, make it their responsibility and let them take pride in doing it well. Give them plenty of praise each time they do it; this is great for their self-esteem. Add one job at a time, so they don’t get overwhelmed, they will learn each skill correctly, this will build self-confidence and self-esteem and is great for morale. Kids love messy jobs, buttons, bubbles, water and measuring, so washing up, putting the laundry in the machine or drier and measuring laundry powder or weighing ingredients are perfect jobs for little ones of all ages. Setting the table helps them to feel part of the mealtime preparation and makes them feel part of a team. Get your kids to tidy up as they go along if they were able to get the toys out, they are equally able to put them away again; this instils a sense of responsibility for their belongings and their environment. Give your kids a laundry basket in their bedroom and ask them to bring it downstairs when you’re doing the laundry, see how to implement this technique in this post, this will help to create good habits and help keep bedroom floors free from dirty laundry! Set a timer! Kids love a race and love working against a timer, see who can collect the most, you or your kids! Only give your child a couple of chores per day, you can rotate duties each week if you want them to learn new skills. Have fun; it’s going to take twice as long do all the chores at first but have fun and play to your child’s strengths. My daughter hates recycling but loves to squeegee the shower, my son loves recycling but dislikes hanging things up. Habits, when ignited in youngsters, are hard to break, make sure they are good habits! Younger kids love nothing better than spending time with their parents, so this is a great way to reward kids for compleating their charts, whether it’s taking each child out on their own, for some quality time or planning a family day out, it’s up to you which works best for your family. This teenager chore chart is great for helping your teenager get my earning it by working hard and being part of the team and helps them see how much they can save. Where can I find printable chore charts for a teenager? As outlined above, our printable teenager template chore chart is perfect as it is customisable so you can add your own chores to the chart following the guidelines in the post for age appropriate chores. This is a parenting call, the reason I use a chore chart for kids is to build self esteem, assume personal responsibility, and encourage team work. What is a good age to teach kids to do chores? my kids started to learn personal responsibility as soon as they could walk. if they got it out they were encouraged to put it away. If I brushed their teeth they got a sticker on their chart , its all about encouraging good habits! How do I convince my 9 year old daughter to do chores in the house? I would start by doing some fun chores together like making breakfast, folding washing, making lunch. She will enjoy spending time with you and not realise she’s helping you. It’s better to teach life skills than to expect your child to graft around the house! All my free printable kids chore charts are available to unlock in our resources library when you subscribe to our weekly updates! Do you have any tips for getting your kids to help around the home? Drop us a line in the comments!